The best thing about being a stay-at-home mom is that there is very little need to look nice. A regular day is pajama pants and an over-sized T-shirt. A fancy day is sweat pants and a fitted shirt. My sister came to visit the other night. She commented on my hair. It took a few seconds to recall if I even combed my hair that day. I may appear homeless sometimes, but my Vietnamese BBQ Pork (Thit Xa Xiu) ... always appears on point. Have you ever seen Xa Xiu premixes at the stores and decided to make Xa Xiu using only the packages to save some time? I did ... multiple times, using different brands in each attempt. Unfortunately, none was quite right. The aroma was there. The aroma was perfect actually, but the flavor was bland and horribly lacking. On the next attempt, I decided to skip the premix and made my own marinade from scratch. Again, something is missing. Flavor is there but the aroma is not the same and color is lacking. asdf#W$!@#!jkla&*#$sdf! Next, I combined the two methods. I mixed a bit of premix and my own marinade. BAM! It worked! I got the beautiful red color, the signature aroma, and the most incredible taste known to mankind. Balance and order was back on Earth and life was good. Whenever I make Xa Xiu, I make sure to make a lot because it can be used in many other Vietnamese dishes. Banh Mi Xa Xiu (VIetnamese BBQ Pork Sandwich) is one of my favorites. The kids loooooooove Com Chien Xa Xiu (Fried Rice with BBQ Pork) and the husband can't get enough of Hu Tieu Mi with Xa Xiu (Pork Noodle Soup with BBQ Pork). Thit Xa Xiu easily satisfies my whole family's cravings for a week! So if you're going to make Thit Xa Xiu, double or triple the recipe to use in other awesome dishes. For those who want the more authentic recipe using fermented red bean curd instead of the premix, I have also included that below. Pick which marinade you want to use. Then in a small bowl, mix together all the ingredients until you get a smooth paste. Using gloves, slather mixture evenly on the pork and marinate for at least 30 minutes at room temperature or overnight in fridge for better results. Preheat oven to 400°F. 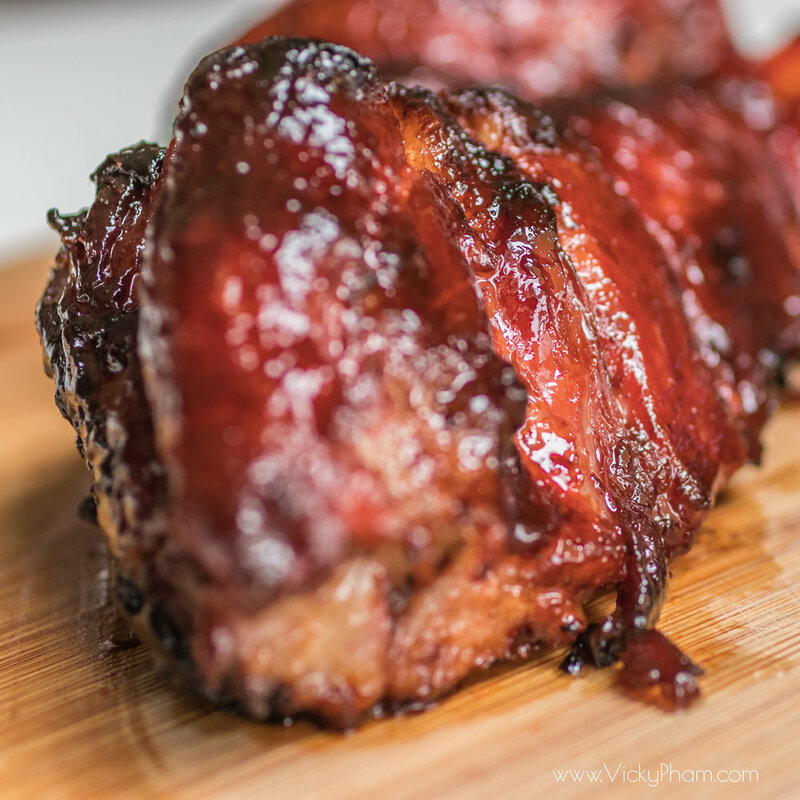 Place the pork on a wired backing rack with a pan underneath to catch the drippings. Bake for 15-20 minutes. Occasionally bast the pork with the drippings to prevent drying. Flip the pork over and bake for another 15-20 minutes, basting along the way. Meanwhile, prepare the honey glaze. Combine honey and water in a microwave-safe bowl and set in microwave on high for 15 seconds. Remove from microwave and stir the mixture with a spoon to make sure the honey is completely dissolved. Once pork is done baking, slather the honey glaze onto the pork. Place it back into the oven and broil on high on the top rack (450°F) for 3 minutes to get a nice caramelization. Watch the pork closely at this point to prevent burning. Once you get nice caramelization on one side, flip the pork over and repeat. Five Spice Powder is a finely ground mixture of five spices: star anise, cloves, fennel, peppercorn and cinnamon. It's a very common ingredient in Chinese and Vietnamese cooking. These five spices make the beautiful aroma of the widely popular Vietnamese dish, Pho. Five Spice Powder can also be used to marinate pork. I have never used any of the spices in my pork marinade. It turns out Five Spice powder pairs beautifully with pork.